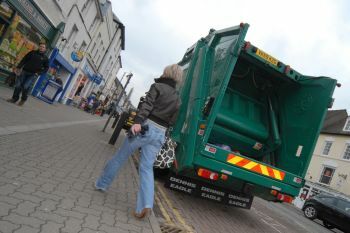 An increasing number of local authorities are choosing to fit Hard Disk Recording equipment to their refuse vehicles to improve health and safety best practice amongst crews, reduce the number of accidents, investigate potential insurance claims or complaints, and enhance the efficiency of their waste collection service. Paul Evans, Direct Services Manager, South Derbyshire District Council, has recently requested ISS Hard Disk Recording equipment and Reversing Radar to be fitted to the latest addition to the fleet. In the case of Caerphilly County Borough Council, they have been specifying this equipment on refuse vehicles for some years and for good reason. In one example they were able to use the footage to illustrate to Councillors, the problems they had been experiencing with narrow lane access difficulties. More recently in April this year, within weeks of receiving five new RCV’s all fitted with ISS Hard Disk Recording, the Council was able to successfully counter a claim made by a member of the public that their car wing mirror had been knocked off by an RCV.